COLOMBO, July 6, 2010 (AFP) - Demonstrators led by a Sri Lankan cabinet minister surrounded the United Nations office in Colombo on Tuesday to protest against a UN panel set up to probe war crimes allegations. Housing Minister Wimal Weerawansa shouted anti-UN slogans as crowds broke through police barricades and rallied at the entrance to the building. "We will not leave. We will sit down and protest here until the secretary-general withdraws the panel," Weerawansa told about 1,500 cheering supporters. 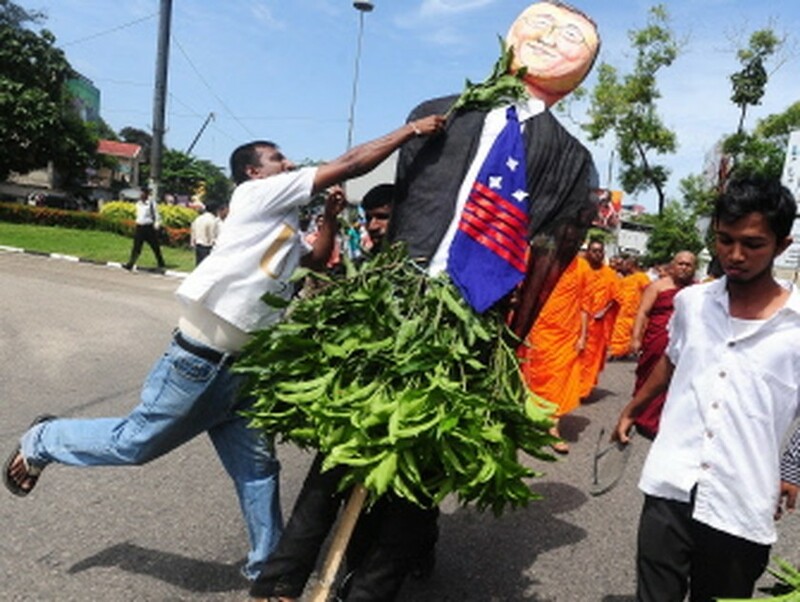 They burnt an effigy of UN Secretary-General Ban Ki-moon, and carried banners that accused him of being a puppet of the United States. Sri Lanka has refused to cooperate with the panel, which was named by Ban last month to advise on "accountability issues" during the war between government forces and the Tamil Tiger separatists. The government has also refused to grant visas to the three members of the panel, meaning they will be unable to visit the island. The Tiger guerrillas were defeated after decades of conflict in May 2009, and the UN has said that at least 7,000 ethnic Tamil civilians were killed in the first four months of last year. Many diplomats see the UN panel, headed by Marzuki Darusman, a former Indonesian attorney general, as a precursor to a full-blown war crimes investigation. Neither the UN office in Colombo nor the government commented on Tuesday's protest. President Mahinda Rajapakse has repeatedly rejected international calls to investigate war crimes allegations. Sri Lanka managed to stave off a UN resolution last year with the help of Russia and China, key allies and arms suppliers to the island. Ban has asked his three-member panel to complete its work in four months.